The beauty of Michigan can be admired during any season. Despite the cold winters, Michigan's picturesque landscapes are ideal for hiking expeditions. 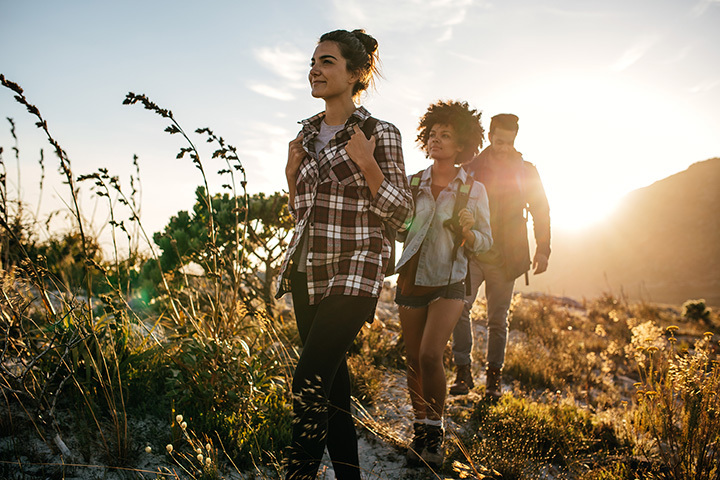 Whether you're an experienced explorer or just someone looking to get some fresh air in their lungs for the day, there is a hiking trail somewhere in Michigan just for you. With no shortage of excellent spots to explore, here are 15 of Michigan's best hiking trails. Those looking for a short, easy trail to start things off will have to do so from some of the most northern parts of Michigan. Near Marenisco, Wolf Mountain Trail offers a foot path trail measuring less than a mile. Wolf Mountain itself is the highest point in Gogebic County, which makes it a fine place to watch a sunset. Wolf Mountain Creek, meanwhile, offers the tranquility of moving water along with some great forest, sufficiently so even locals enjoy checking out the color therein. This Bay City trail, considered a moderate-difficulty trail with several uses, offers several exciting interactions with natural elements. Not only is it a stone's throw from Saginaw Bay, but it will also take the user around Tobico Marsh as well as in the area of the Tobico Lagoon, which itself measures 900 acres total. Those hoping to see wildlife will have plenty of possibilities as everything from deer to mink are on hand, and the trail is widely regarded as a masterpiece of birding, allowing travelers to see huge varieties of waterfowl. The Feldtmann Ridge is called a moderate-difficulty trail ranging nearly 30 miles, taking walkers through Isle Royale National Park. Michigan isn't commonly associated with islands, so seeing one can be quite an experience in itself. Regarded as an excellent backpacking trail, walkers can check out the forests and open ridges-a great combination for anyone looking for a color tour with fall coming on-and even do so in comparative peace and quiet, as Feldtmann Ridge gets some of the fewest travelers. Near Traverse City, Sand Lakes Quiet Area will offer some great mixed-use hiking opportunities, including the ability to go by foot or by bicycle, with both accommodated. That versatility will be augmented by the scenery involved. With five small lakes and a complete ban on motors, walkers and bikers alike will get access to a quiet, scenic walk that even offers campsites for those who want to keep the hike going for days. Those looking for an easier time in Michigan's southern environs need only check out the Dowagiac Woods Nature Sanctuary. Those who think "easy" is just a synonym for "boring", however, need only consult with the Michigan Nature Association, who calls this lake-laden wooded preserve the "jewel in the crown" of MNA offerings. Home to animals from the Acadian flycatcher to the box turtle, including some nearly-extinct species, there's a lot to like on this easy walk. Part wetland, part dune, the Huron County Nature Center & Wilderness Arboretum contains a comparative rarity of natural science: a dune-and-swale ecosystem. That's a noteworthy point alone, but there's a lot more to check out here. Come and see the land that the area's chapter of the Federation of Women's Clubs has been protecting for over five decades, fighting tooth and nail against developers of all stripes, including some efforts to farm it. Those who proceed are in for a great natural experience. Taking a swing up Lake Michigan to Muskegon, hikers will find Hoffmaster State Park waiting. A combination of foot paths and Nordic trails-a kind of cross-country skiing available once Michigan gets some of its famous snow-Hoffmaster features the Dune Climb Stairway, a 193-step climb to a viewing platform atop a sand dune. The climb is considered so arduous that there are even benches built in on the climb itself for those who want a break mid-climb. With much easier paths available, Hoffmaster offers a variety of experiences in one. When it comes to hiking versatility, it's hard to pass up Black Mountain Pathway in Onaway, not too far from Cheboygan in the northern Lower Peninsula. Offering 30 miles of groomed trail, users will not only have a great hike ahead of them, but can also engage in biking, cross-country skiing, and even get in on some horseback operation. Plus, the paths have even been constructed in such a way that a range of skill-based challenges are available, with trails rated from "easy" to "most difficult" on hand. Ready for a big dose of history with your hike? If so, the Cass City trail known as the Sanilac Petroglyphs Historic State Park will be waiting, in a big way. An easy-rated, interpretive trail, the usual features of forest and water are on hand, but the big draw is right in the name. A huge slab of sandstone estimated to be somewhere between three centuries and a full millennium old is on display. The slab is covered in carvings called "petroglyphs," the only such example of the craft found in Michigan. Not too far from the earlier-mentioned Sand Lakes, Sleeping Bear Dunes near Empire is one of Michigan's foremost natural destinations, and with good reason. Packing in beaches, massive sand dunes, forest space, and even some farms and a maritime village, there's a lot to see. It'll likely take more than a couple days to check out everything connected with Sleeping Bear Dunes, so be sure to block plenty of time on the calendar for this one. In Ludington-as the name suggests-the state park of the same name offers 5,300 acres to consider and with all that space, there's a lot waiting for the intrepid (or not so intrepid) hiker. Foot paths, beach walks-the park includes fully 5.5 miles of Lake Michigan shoreline-a boardwalk, and even what's known as an "interpretive trail." Home to the Big Point Sable Lighthouse and even a canoe trail that lets visitors into the various waters near Hamlin Lake all wait for those who want the most out of their nature experience. Those who want some real extremes of terrain should point themselves toward Munising, where Pictured Rocks National Lakeshore awaits. With trails ranging from a quarter mile to over 42 miles, hikers will get views of waterfalls, Lake Superior, and even a set of sandstone cliffs. As far back as 1820, voyageurs like Henry Rowe Schoolcraft were calling the area home to "some of the most sublime and commanding views in nature." It's also got a record to its credit as it's the first National Lakeshore in the United States by legislation signed by former President Lyndon Johnson. One of the biggest Lake Michigan towns around, those who want a break from the excitement and bustle of the city can instead hit the Rosy Mound Natural Area. Considered a "challenging" hike, and featuring stairs with dunes and boardwalks, this park's biggest feature is the one the area was named for: Rosy Mound. Rosy Mound is nearly 200 feet of sand dune, named for the unusual pink color it takes on near sunset. While Rosy Mound was once a mining site-Midwest foundries ran on Rosy Mound sand-it's now taken on some protection and is a natural wonder of Michigan. The name may sound a bit off-putting, but for those who want variety, then Buttles Road Pathway near Lewiston is one of the best destinations you'll find. Not only are there a variety of ways to get around in the park, including foot travel, Nordic trails for skiing, and bicycle paths, but there will also be a variety of terrains on hand. Woods and trails will be on hand, as should be expected, but the sinkholes will be the real draw. One ravine contains no fewer than seven sinkholes (at last report) so users will be in for a multi-terrain treat. Near Tawas City, the Corsair Trail System will offer skiing and hiking, and a range of experiences so broad that the overall difficulty of this trail is regarded as "easy to challenging." This all but ensures that someone will find something worth trying out here, as simple up-and-down hills turn with little warning into twisty trails. Even the lengths vary. Hikers can try loops ranging from a simple 1.5 miles to a leg-stretching seven miles. Reports even note that Corsair is one of the oldest Nordic skiing trails in Michigan, so those who like a little history with their hiking will be well taken care of. View more Michigan Hiking Trails.